It’s August although you wouldn’t know it here in Charlotte. Yesterday boasted blue skies and temperatures in the mid-70s. The windows came down in the car, it felt a little chilly last night, and I had cravings for butternut squash and braised meats. Today it remains cool, but rain has set in and my sofa is issuing a siren call for me to stop work and curl up on it with a good book and a blanket. I’m resisting for now, but only because a forecast for a weekend of rain has me thinking that I’ll have plenty of couch potato time over the next few days. Rain and thoughts of lazing on a couch with a good read tends to get me hungry for my favorite comfort foods and I’m thinking tomorrow I may have to fry some green tomatoes. 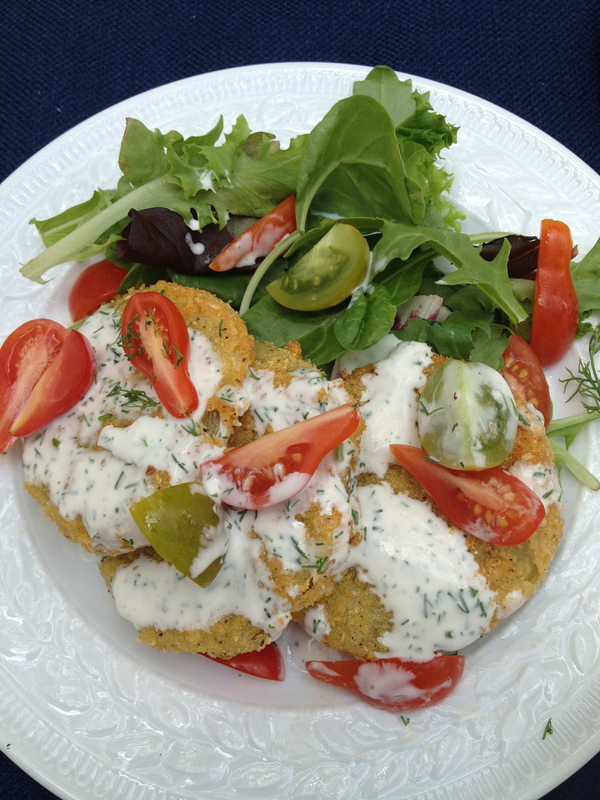 I posted this recipe for Fried Green Tomato Salad with Buttermilk Dressing last year on my blog and demonstrated it on Wednesday for the local Charlotte Today show. After sneaking a small bite after filming, I decided that I need more green tomatoes in my diet. Actually, I decided that I need more FRIED green tomatoes in my diet. This salad is delicious, but in honor of the cooler temps and a hankering for comfort foods, I’m thinking that the standard BLT might just need elevation to BLFGT status. Care to join me? 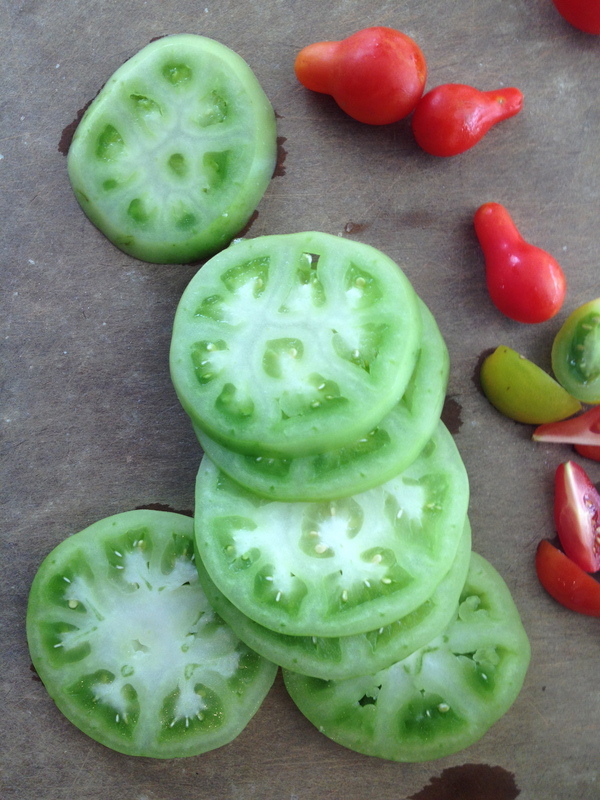 Click here for the video on how to fry green tomatoes. For those with self-control, the recipe for the salad is below. For everyone else, skip the steps for the salad and fry up some green tomatoes for your Saturday sandwich. Happy cooking…and eating. Oh, it’s a shame it’s so hard to get my hands on green tomatoes around here! I’d love to try it! I’m not sure if it’s possible grow tomatoes in a pot – I live in a flat!